Whether you are looking for a venue for your wedding day, birthday party, baby or wedding shower, golf tournament, fundraiser, or anything in between we have created a straight forward booking process with no hidden fees that will make your event a success. Please contact us at 401-364-0700 or email us through our contact page and we will help you gather the information you need. 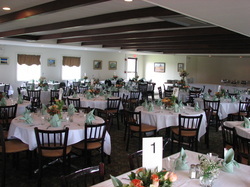 The banquet room seats 125 comfortably with a band or DJ and dance floor. We do not charge for the room, we simply charge for the food and service gratuities. Please browse our menus below and contact us with any questions you may have in order to facilitate booking your event.